To make a shaded strip, first put together three triangles of Fimo. One white, one spring green and one leaf green. Those familiar with the 'Skinner shade' technique might be surprised by the third colour. This is because a shade from dark green through white produces a rather strange and unrealistic light green in the middle. 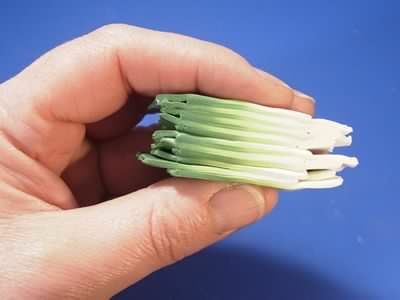 The 'shade' is produced by folding and rolling always in the same direction. 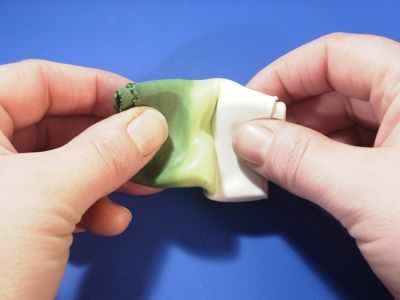 Fold in half and roll preferably through a pasta maker although with patience a rolling pin will do. 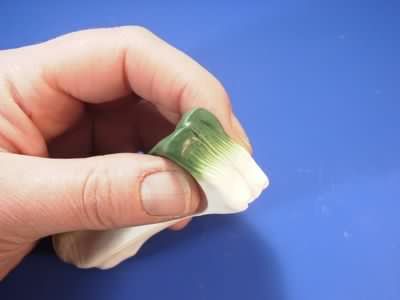 Continue rolling and folding until you have achieved a gradual shade throughout. 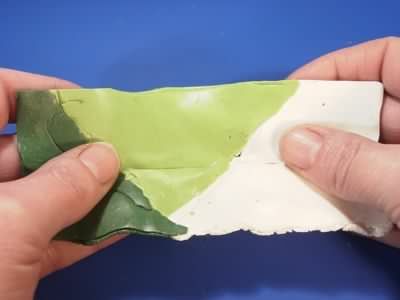 Fold again and carefully squeeze and press the resulting piece to narrow it. You will then pass it through the pasta maker (or roll out)again to produce a very long thin strip. Stack up these pieces, deliberately misaligning each alternate piece. As you can see this produces a combination of shading and stripes. 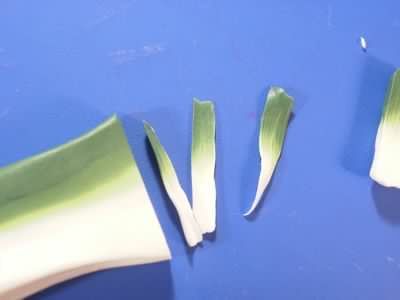 Just like a real leek! You'll need to add a little extra white to the bottom and green to the top. 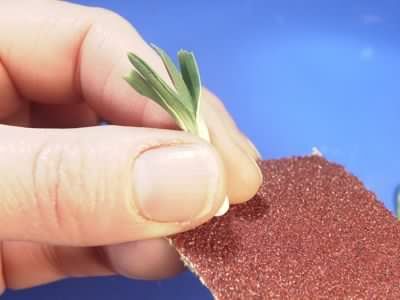 Squeeze and lengthen the strip until you can cut it into slices, with a single sided blade, thin enough to produce individual leaves. You can cut slightly thicker pieces for the centre. 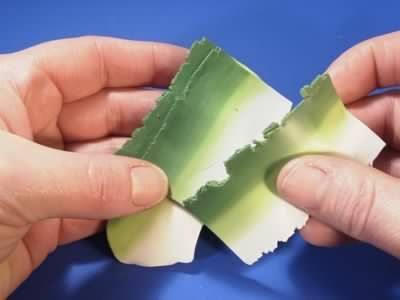 Roll a centre and cut into the top to simulate individual leaves. 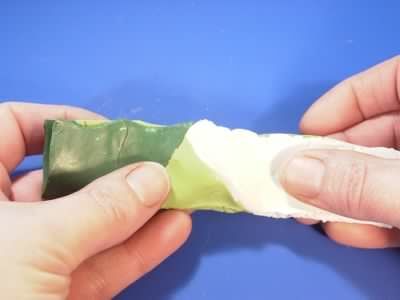 Add single pieces to the outside. Two should be enough but you could use four or more. 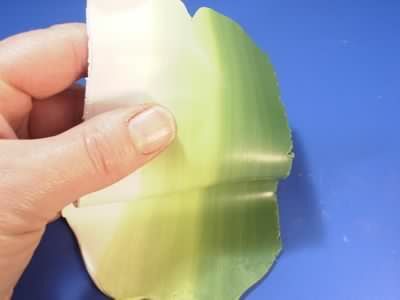 Tap the bottom of the leek on a piece of very coarse sandpaper. 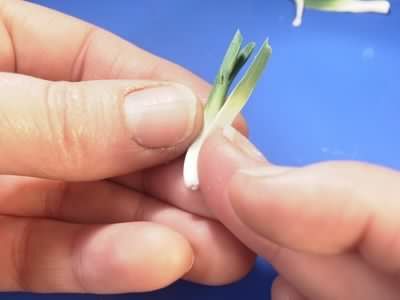 You could dip in brown powder to simulate mud on the ends.Leeks come in all sizes so even in twelfth scale (1" scale) you can get away with a wide variety of sizes from 'weedy' to 'prize winner'!